Don't know what all of these numbers mean? Take a look at our explanation for Team Stats and Individual Stats first. Despite looking lost and confused for much of the game against the Syracuse 2-3 zone, Marquette had an about average day offensively. It was worse than our season average, but still not that bad. As evidenced by the 118.2 efficiency that Syracuse achieved, this was a game lost on the defensive end. 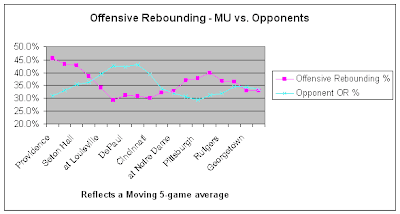 Interestingly enough, although Syracuse is one of the top teams in the country at offensive rebounding percentage, that was the only one of the four factors that Marquette won. Thanks to their dominating inside presence, Syracuse was able to achieve an eFG% of 63%. In addition, Syracuse enjoyed a notable advantage at Free Throw Rate. What really hurts, however, was that Marquette lost the Turnover Rate battle. Remember that for the season, Syracuse averages a turnover rate of 21.2%, so they did better than that against our vaunted defense. This is an aspect that Marquette almost always wins. First of all, please note that none of these numbers include results against Florida Gulf Coast. It was a cupcake game, it skews the numbers, and I don't think that it's representative of how well the team is playing. The story is not pretty here. Marquette is heading in the wrong direction at the wrong time. Our offense and our defense are both getting worse. Our final Big EAST numbers for Offensive and Defensive Efficiency are 104.8 (Offense) and 98.9 (Defense). A team with those offensive and defensive numbers should have a final record of 11.9 - 6.1. Given that Marquette finished with a final record of 11-7, this means that the team underachieved. ... the roller coaster that has been our offensive rebounding percentage is once again on the decline. Our offensive rebounding is getting worse and our opponents' offensive rebounding is getting better. The only player that had a decent game was Jerel McNeal, but this is also an area where the defensive ratings fall short. Because the Box Score doesn't capture the number of times that Donte Greene scored an easy post-up basket on McNeal, his defensive ratings show up well. Everyone else pretty much had a hand in the seventeen point loss, and the worst impact on the game came from our floor general. I'm decidedly bearish on Marquette's prospects for the post-season. Almost all of the numbers are heading in the wrong direction, and our team's strengths are in decline. The team has even underachieved according to those numbers. Not only that, but ignoring the numbers, Marquette is still only 3-8 against the RPI Top 50 teams. I'm not trying to be "doom and gloom" here, but if MU was a stock, I'd short it. It's too bad that fanhood isn't something that people can just dump and eliminate losses. Of course, tomorrow is a new day, and the Big EAST Tournament is another chance to start fresh. Looks like we're going to face Seton Hall (according to Rosiak) for the third time this season. Game time will be 8 pm on Wednesday at Madison Square Garden. We are at this point every season - hoping for a hot streak while the team is stumbling into the post-season. I think this is just a sign of the team structure. We are built on energy and cannot sustain it through the conference season. Hopefully this is finally a wake-up call to Crean. Finally, I have been a James supporter this season, but I am now convinced that he is talented, but just not a winner. He gives effort, but I don't want the game to depend on him offensively or defensively. I know it is a bad comparison, but I trusted Deiner at the end of the game. Even give me crazy McNeal at the end, at least you know you will go down fighting. I might agree with you on James. You felt good with the ball in Diener's hands and even more so w Novak on the court, but I have not seen James execute a good game winning/tying possesion at the end of a critical game. (ND and GT as examples where he did not even get us a quality shot). It appears that he was too set on taking the shot himself and falls out of his routine. My only memeory was of a desperation he made to extend the Louisville game once that was perhaps 2 years ago. Henry, rather than drop out really weak games out of the stat pool, why not adjust for the strength of the opponent? That way you would get a truer picture of performance. why not adjust for the strength of the opponent? I can't think of any way to work on the overall numbers such that they account for better or worse opponents. 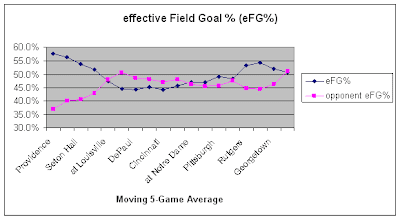 There are some calcs to remove the correlation between offensive and defensive efficiency, and we using a moving 5-game average to show a trend. Also, I only removed the FGC game... not anything from Nov/Dec. But the bottom line is that I don't know how to do it. I'd feel much more comfortable facing Seton Hall if Crean had pitched a fit after DJ recived his second cheap shot from Nutter. I know it's another example of Crean's just "learning the game" or is it "ineptness du jour." Dude, you be DJ's body guard.